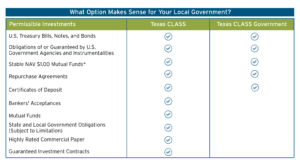 Texas CLASS offers two distinct investment options for local units of government in the State of Texas. Participants are able to invest in one or both funds based on their particular investment needs. This includes the ability to transfer funds between Texas CLASS and Texas CLASS Government. The information presented should not be used in making any investment decisions. This material is not a recommendation to buy, sell, implement, or change any securities or investment strategy, function, or process. Any financial and/or investment decision should be made only after considerable research, consideration, and involvement with an experienced professional engaged for the specific purpose. All comments and discussion presented are purely based on opinion and assumptions, not fact. These assumptions may or may not be correct based on foreseen and unforeseen events. Any financial and/or investment decision may incur losses. For a complete listing of eligible investments for both funds, please review the Texas CLASS Investment Policy. A ‘AAAm’ rating by S&P Global Ratings is obtained after S&P evaluates a number of factors, including credit quality, market price exposure, and management. Ratings are subject to change and do not remove market risk. *You may incur fees associated with wires and/or ACH transactions by your bank, but there will be no fees charged from Texas CLASS for such transactions.